Sierra Leone: What's the Message in Minster Paul Kamara's Words? Baltimore, MD--3/1/2013--Paul Kamara, Sierra Leone's Minister of Youth and Sports, says all the right things at the right time about young people and jobs, but can't quite find the right words in the sports arena. Less than a week after he was lauded for telling a gathering that the Koroma administration is working to find a lasting solution to youth unemployment he was raking over coals in a long-running controversy. 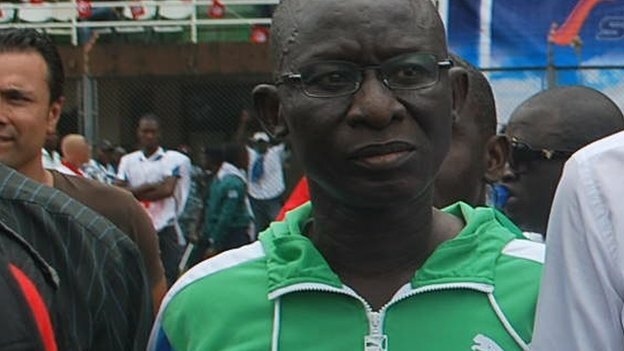 In what was widely regarded as a controversial move, the minister dissolved the Sierra Leone Football Association (SLFA) last September forcing FIFA (the International Federation of Association Football) to step in and set up a "normalisation committee" to run the affairs of the SLFA for a period of six months, according to Sylvia Blyden. One report said it was clear that the minister was not happy with the SLFA Appeals Committee's decision to allow Rodney Michael, who the minister banned from sporting activities, to contest the national football association's presidential election. “Rodney Michael will not contest the SLFA elections, it'll be over my dead body,” Minister Kamara reportedly said. Almost six months on, the question on the lips of sport reporters and fans is what Minister Kamara plans to do next. A recent interview the minister gave on a local radio station was transcribed and translated by Sheikh Umarr Kamarah, a professor of English and linguistics at Virginia state University. Prof. Kamarah is a linguist and a poet and has also published a grammar of Temne, several book chapters, and articles in refereed journals. The Paul Kamara interview: Text, Con-text, and Sub-text. Minista, bak to dis ilɛkshɔn, bikɔz “a lot of people” dɔn “raise concern” se yu trowe sɔpɔt to Isha Johansen ɛn yu lɛf di ɔda “candidate” dɛm. (Mr. Minister Sir, let us go back to this election thing because many are concerned that you have thrown your weight behind Isha Johansen, excluding the other candidates). Wɛl, mi nɔ si ɛni ɔda kandidet… yu no… if a si ɛni ɔda kandidet a go se yɛs a si dis ɔda kandidet…yu no… ɛn mi nɔto pɔsin we na ipokrit; “as minister” na mi de le di “guidelines”…yu ɔndastan? ((Well, I don’t see any other candidate, you know. If and when I see another candidate, I will acknowledge that I have seen another candidate, you know. I am not a hypocrite; as Minister I am responsible for laying down the rules/guidelines, you understand? So, if I choose Isha, who has done more than Isha? If anyone has done more than Isha, you understand, then OK, I will support that person. Look, I just believe that, you understand, we should begin to support “things” that move Sierra Leone forward. We also have the local content policy. The local content policy makes it clear: Anywhere a Sierra Leone locks horn with anyone else, even if that other person is a Black person (an African) from Guinea, Nigeria, Ghana, you know, let me bring it closer to home; not even to talk of one who hails from or who is Lebanese, Irish, you know, wherever you may come from, the Sierra Leonean wins. Don’t mention Davidson Nicol in a discussion about Bailor Barrie (concern yourself with money, not education). Who gave birth to hatred (bad at)? What I am now trying to do is to make the Sierra Leoneans who are said to hate one another, like themselves, so that they change their bad ways. Well, we who are trying to come cure that disease should begin by giving confidence to the Sierra Leonean. That is why I said that as long as I am the Minister of Sports, it is the First Class, I mean, I mean the, the Local Content Policy that I support and promote. Those vilifying me are involved in gambling---they have gambling machines that everyone knows about. So, if you run a gambling business, you have no business contesting elections, you understand? I am the custodian of Sports, you understand, in this country. Therefore, everything has to be legal, in line with what FIFA says, in line with what CAF says, and according to the laws of this land)). ɛ, yu fil se Rodney Michael nɔto di rayt kandidet, Isha na di rayt kandidet? If Rodney Michael…yu no…in no se i kwalifay, i no se…yu ɔndastan…we mi dɔn “disqualify” am “as a Minister,” dɛn i dɔn padin mi, a nɔ “forgive” am i se i wan chakra a gɔvmɛnt Minista we mi dɔn sɔspɛnd am, lɛ i go bifo nɔmɔ, “at the end of the day,” i go no udat go fil am na im iya. A lɛk dɛn gɛt mɔni te…a min…dɛn kɔl dɛn sɛf “dɔdɔ? ?” “at the end of the day, it is clear that” … a min…if sɔmbɔdi nɔ gɛt “remorse” i se i wan chalenj “a Minister,” ɛn mi we dɔn “sacrifice” mi “life” ɔl gɔvmɛnt dɔn jel mi; yu na Iri…, yu kɔmɔt usay yu gɛt fɔ kɔmɔt…yu ɔndastan ɛ…yu kɔl yu sɛf Salonean bɔt yu no usay yu de kɛr yu mɔni go we yu de mek, nɔto Salon yu de lɛf am…yu ɔndastan ɛ…? Dɛn yu se we mi de tray naw, we mi dɔn “sacrifice,” dɛn dɔn jel mi fɔ Football, dɛn dɔn siz ɔl mi prɔpati, a dɔn sɔfa fɔ Football, dɔn a si sɔmbɔdi we i “dynamic” mɔdan ɛni ɔda pɔsin ɛn jɔs bikɔz una wan kam “create a Mafia business” kam na dis Kɔntri, una se Mama Salon in pikin dɛm una fɔ kil dɛm? Jɔs lɛk aw dɛn ɔl dɔn bi lɛk slev ɔnda dɛm, mi nɔ de “allow” dat. So na fɔ fri Mama Salon in pikin dɛm. Then you want to tell me as I am trying, after having sacrificed, after having been jailed for football, my property seized, I have suffered for football, then I see someone who is more dynamic than anyone else, and just because you want to create a Mafia business in this country, you say to kill Mama Salone’s children? As it is now, they (Mama Salone’s children) are all like slaves to them (the gambling Mafia), I will not allow that. So, the goal is to free Mama Salone’s children)). So, wetin nay u “message” to Saloneans? ((No, it is clear…you understand eh…I have declared my support for Isha and you think I as a Minister will allow them? Anyone can contest but he or she who is not supposed to contest this election will not contest)).